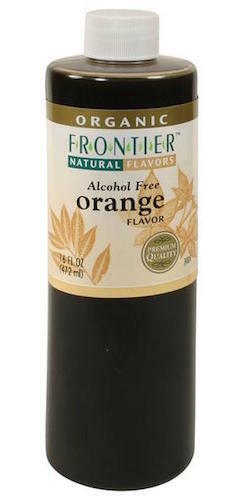 Frontier Natural Products Organic Orange Flavoring 16 oz. Organic Orange Flavor is non-alcoholic and derived from pure orange oil in addition to natural sunflower oil to help carry and preserve the flavor. Our orange flavor gives a stronger taste to recipes than orange juice and is more conveinient than squeezing an orange. Use orange flavor to add brightness to smoothies, cookies, muffins, breads, ice cream, puddings and icings. Ingredients: organic sunflower oil, orange oil.